As I sat in my conservatory on Friday afternoon/evening I could see the approaching hooked cirrus from the north later followed by big pillows of altocumulus. A sure sign of strong gusty wind to come! Sure enough on Saturday 20th May the wind came from the west and ticked all the boxes. The Race Officers Alan Grose and Jane Goddard set a westerly group with two rounds of 4.2 miles for U class, St Just to starboard, Rustler (Waterloo) to starboard, finish. 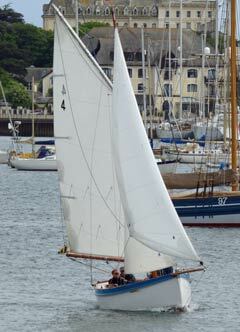 The other class W, G and B had a 3.3 mile course Vilt to starboard, Rustler to starboard twice and finish. Thirteen boats started and first to go were U class off the club line at 1400 hrs. We got a good start off the quay in Trifle and held our own to the end of the moorings. To set a spinnaker or not? That was the question. The wind was shifty but the gusts were very strong and unpredictable so we persevered with full main and no 2 genoa. Wilkie, Bob Chapple rolled out his giant genoa (not a euphemism Bob) and went through us Kiamana with copy cat reefed main to Wilkie also went through us. Mandy and Dave Owen in Aurora bravely flew a kite taking all of us to windward. A lot off rock and roll ensued, (I know why Mandy, but will keep it secret for now, you work it out?). Aries and Mr G followed on behind. As we approached the St Just Buoy Aurora peeled of and retired from the race, we wondered what had gone wrong? A broken spinnaker pole was one thing but racing through the moorings at the start was the decider! Wilkie rounded followed by Kiamana, Nigel and Jess Rowe and then Trifle, Aries and Mr G. Slowly but surely Trifle managed to overhaul first Kiamana then Wilkie and reached the Rustler buoy first. A tack onto a bear away toward the club finished up as a beat into the Trefusis shore? Wrong! The rest of the fleet went south, got a massive lift and then made a ¼ mile on us by the time we came into the inner harbour gap. Yuk! We were greeted at the start of the moorings with three magnificent working boats without their topsails coming out of the harbour. It is difficult to distinguish them without the tell tale topsails but acres of white canvas went by and continued toward the Vilt. 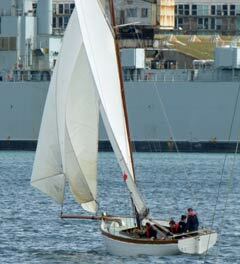 Len Cheshire in Sweet Friday was cruising along with full main and genoa past the eastern arm of the docks. Len later admitted to having a splash of spray hit his absent locks and I pointed out the ensuing salty rime on his pate! Again he had a sail over. A welcome newcomer to the G class fleet was Charm helmed by Nick Bradley who won the three-boat medley with Miss Agnes, Mike Rangecroft beating Clementine, Alan Perham by a whisker. In B class Arthur Williams in Winnie beat Florence with Cousin Jinny retiring. U class did a second round with Wilkie pulling out a big lead on the rest of the fleet. Kiamana was second over the line but was beaten narrowly by Trifle on corrected time into third place. Tea was served by Carol Robson and some very yummy cakes ensued. Thanks to Race officers and Sue Clark for the results. John Maunder for the bar and Working Boat start and Giles for our safe return to shore. I am away in sunny Brittany for two weeks so Bon Voile la Bateau or words like that and see you in June when we will decide the next 4 years and beyond! !